Before the outbreak of World War II, there were around 56,000 Jews living in the Greek port city of Salonica. By the end of the war, nearly 98% of the Jewish community from Salonica had perished from gassing, forced labor, starvation and disease in the Auschwitz-Birkenau concentration camp in Poland. Only 11,000 Greek Jews, from a total pre-war population of 77,000 survived the Holocaust, a figure that includes approximately 1,100 who returned from the Nazi death camps. The city of Salonica was once the center of Sephardi religious and cultural life, and Jewish intellectual life in general, and once boasted such cultural institutions as a Judeo-Spanish theater, press, secular literature and music. The city virtually ground to a stop on Saturday, the Jewish Shabbath. But most survivors today of Greek Sephardic descent believe that the Ashkenazim, the Jews of Eastern and Central Europe, have marginalized their suffering. They believe that their experiences have been treated as an afterthought by academics and organizations, most notably Yad Vashem, the Holocaust Museum in Jerusalem, Israel, and the New York-based Claims Conference. Both have cited numerous sources to prove otherwise. 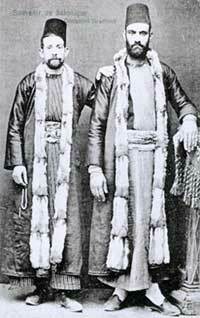 The Jewish community of Salonica flourished for many centuries. As late as 1912, they were the largest ethnic group in the city. But in 1917, a great fire ravaged much of Salonica, and left the Jews fragmented and impoverished. With the advent of Greek nationalism and the resettling of Orthodox Christians in Greece in 1923, Salonica’s Jews began to feel increasingly marginalized. Before the two world wars, periodic outburts of anti-semitism occurred, such as the translation into Greek of the famed forgery, the Protocols of the Elders of Zion, in 1928. Its possible that some 20,000 to 25,000 Jews left the city before World War II erupted. In April 1941, Nazi Germany invaded Greece, King George II fled Athens, and a pro-Axis puppet regime was installed, with the country divided into three different zones. Athens and certain islands were under the control of Italy; eastern Macedonia were under the control of Bulgaria; and the Nazis controlled Salonica. Soon, a ghetto was created for Salonica’s Jews and they were forced to wear the yellow star. Frightening public spectacles of humiliation of Jews became commomplace, and it was not long before they were deported to concentration camps, which began in March 1943. Approximately one fifth of Salonica’s population was deported, which led to widespread looting of Jewish homes and businesses. It is still difficult for survivors to reclaim their stolen property. Salonica’s chief rabbi at the time was Zvi Koretz, a particular controversial figure. He was an Ashkenazi ordained in Vienna, and had become the chief rabbi of Salonica in 1933. He held a doctorate in Arabic and medeival Islamic philosophy from the Hamburg Institute for Oriental Studies, and was later accused by the Greek Holocaust survivors of being a collaborator. Koretz became the chief rabbi at a time when the Jewish leadership was searching for a more modern approach to Judaism in the city, especially after the traditional leader, Haham Haim Habib, refused to shake the hand of the Greek queen for reasons of religious modesty. But the appointment had the opposite effect, and Koretz quickly became unpopular for his rigid and arrogant demeanor. He was arrested by the German army a month after the invasion of Greece. He was sent to Vienna where he was imprisoned for eight months, charged with promulgating anti-German propoganda. In 1940, Koretz actively protested the Italian bombing of the Saint Sophia Church in Salonica, which caused many Greek Jews to eye him suspiciously, and eventually believe that he had been brainwashed by the Nazis to become a collaborator. In addition, he served as the liasion to the German authorities in the early 1940s, and was forced by the Nazis to head the local Jewish Council. In this role, he was able to negotiate the release of 4,000 young Jewish men taken for forced labor, but was unable to raise the fund necessary to save a 500-year-old Jewish cemetary, one of the largest in Europe. The Germans demolished it, and used the headstones for the construction of roads, swimming pools and urinals. In the first large scale public action against the Jews of Salonica, General Kurt von Krenzski, the commander of German forces in northern Greece, ordered all adult Jewish men to assemble on Eleftheria (Freedom) Square on the morning of July 11, 1942 to register for work details. Instead of receiving work assignments, however, the nearly 10,000 men were kept standing in the sun for the entire day while German and Italian soldiers humiliated them in front of the non-Jewish population by forcing them to perform calisthenics and other distasteful tasks. Those who collapsed from the heat and exhaustion were beaten by the troops or doused with cold water and again made to stand. The Final Solution started in Greece in February 1943, with the arrival of two prominent Nazi officials, Dieter Wisliceny (a close aide to Adolph Eichmann who supervised many deportations) and Alois Brunner. When the two arrived in Salonica, they immediately enacted anti-Jewish measures, and Koretz counciled the community to abide by them. In contract to the chief rabbi in Athens, Elias Barzilai, who was a Sephardic Jew, encouraged his community to flee, Koretz told Jews they would be safely resettled in Poland and would eventually find work elsewhere, according to some historical accounts. Many notable Salonican and Greek Jews stand out for their bravery during the war. Salonican middle-weight boxing champion, Jacko Razon, smuggled soup for famished inmates from the kitchen in Auschwitz-Birkenau, where he worked. Fifteen-year-old Jacko Maestro became work coordinator for the 10,000 internees, and saved several lives by bribing the German guards. In 1944, Greek Jewish Sonderkommando workers staged a revolt in Crematoria III and IV, killing several Nazi guards. A Salonican Jew by the name of Isaac Baruch managed to put a bomb in the furnace of Crematorium III, and the building was destroyed. 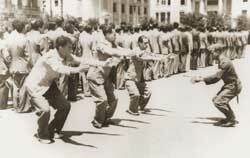 The plotters were publicly shot, singing Greek partisan songs and the Greek national anthem. At the end of the war, Salonica’s one thousand surviving Jews returned to the city to find their homes and businesses taken over by Greeks, who refused to relinquish control of the looted property. Most chose to leave the city of their birth, heading to the United States or Palestine. Very few remained behind. Today, there are around 250 Greek Jews living in Israel.